Welcome to Phoenix: where the sun shines perpetually, mountains set the skyline, and the desert paints a postcard of cosmopolitan Arizona. 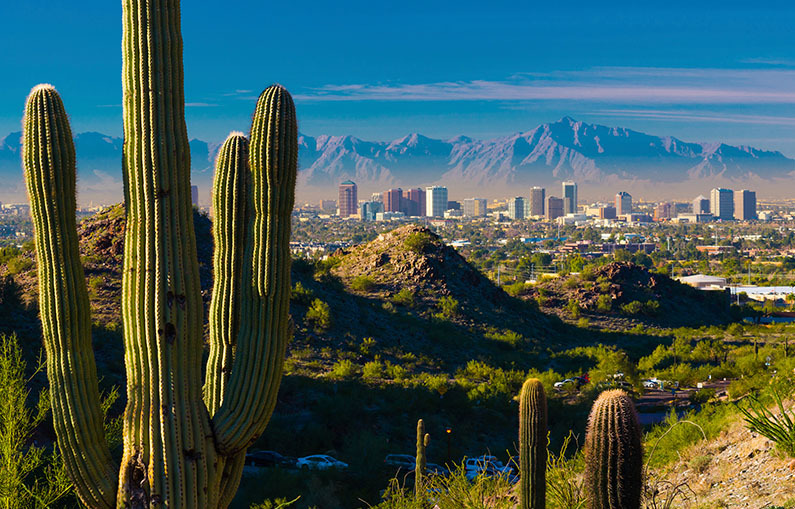 With endless acreage of parks and preserves, diverse cultural attractions and events, and distinctive flora and fauna, Phoenix offers a vibrant traveling experience to its visitors year-round. Whether you’re an experienced climber or a total novice, the majesty of Camelback Mountain is the pride of Phoenix. Tourists and locals alike flock to this colossal mountain, made up of red sedimentary sandstone and granite. Both of its hiking trails are described as “difficult,” so pack more water than you think you’ll need and soak in the splendor of Arizona beneath a beating sun. Technically called You Who are Getting Obliterated in the Dancing Swarm of Fireflies, “Fireflies,” The Yayoi Kusama Infinity Room at the Phoenix Art Museum, is a fantastic, whimsical tribute to those little critters we caught in jars throughout our childhoods. The artist, Kusama, constructed an intricate display of LED lights, which closely resembles a starry night or a turquoise waterfall. This unique exhibit can also be found at the Whitney in New York, though this installation is the larger (and more impactful) version of the two. For generations, music has connected us, and the Musical Instrument Museum is a terrific testament to the ways in which we interact with sound. One of the top-rated attractions in Phoenix, and seemingly the world’s only global musical instrument museum, the MIM hosts exhibits like “The Golden Age of Jazz,” and also boasts an “Experience Gallery” where guests are invited to make some noise of their own. Listen closely and the music tells a story all its own. Although the Hole in the Rock may not seem like a noteworthy destination, this interesting rock formation is one-of-a-kind. Climb atop the rock and earn spectacular views of Phoenix, burning a few calories in the process. This fantastic natural phenomenon provides a different perspective of Phoenix that only nature itself can deliver. To plan your trip to Phoenix or for an extended guide of things to do, visit the official Phoenix city guide at http://www.visitphoenix.com.